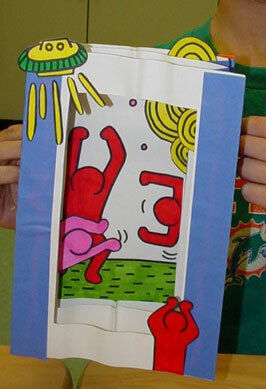 For this project we studied the iconic symbols Keith Haring would make in his artwork. We thought his symbols were so interesting, and thought you could almost tell a story using the symbols. The students came up with a background for the images (he used barking dogs and space saucers a lot, so their backgrounds usually were "settings" where these things could be found). The characters were then drawn, using characters Keith Haring would use in his pictures, and were added to each frame. From Judy: Keith Haring also did many works on world issues – social concerns. Maybe select a theme – or have your student brainstorm on themes to make this world a better place. Study some of Haring’s posters in particular. Have student wrote a short paragraph or two what their story is all about and glue that to the back of the book. Student could use the computer to write their story. Make it interdisciplinary and have them write a short poem. Tunnel books look like a series of cardboard sheets which stand parallel to one another and are viewed from one end. This project is a "tunnel" or "peephole"book with a set of pages bound with accordions on two sides and viewed through a central opening. Openings are cut in all but the last sheet so that the viewer looks through the layers while seeing parts of them. Writing in the tunnel books is probably best if large and brief. Initially made for promotional purposes, like the opening of the Thames Tunnel in 1851, tunnel books have become popular with artists, including Edward Gorey. The tunnel book, also known in the 19th century as a "peep show", was developed as a three-dimensional souvenir, used to document and recreate for the viewer, important places and historical events. 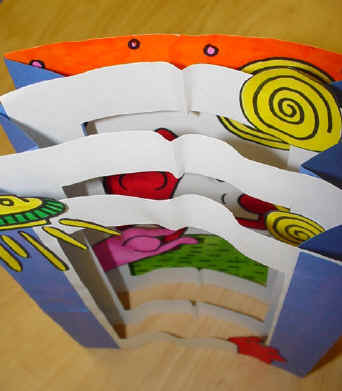 The tunnel book format has also been used as a structure for making illustrated children's books and paper theaters. The popular method of folding and cutting so that opening pages causes part of the page to move or poke out in an unexpected manner might be an interesting way to reinforce a concept. This project combines these two styles. Day 1: Begin discussion of foreground and background- link to literature. Background is similar to the setting of a story- it is where the story takes place. The background includes the sky, sea, land, mountains, etc. The foreground is similar to the characters in the story- the foreground contains all the details of the composition. 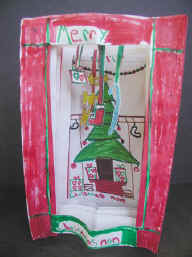 Using one sheet of 6x9 white paper, have students create their "setting". Have them trace the ruler on the left and the right of the paper in the vertical position to make a one-inch area on each side of the paper. The background picture should fill the space between the ruler lines, making sure not to put important objects too close to the top or bottom of the page. Draw in pencil, trace with Sharpie (optional) and color with markers. Day 2: Review vocabulary (foreground, background, setting, characters, details). Have students finish coloring the background. Next, have students fold the remaining 4 sheets of 6x9 white paper in half to cut out the "frames". Save the scraps! Using the 2 colored pieces of 9x9 paper, have them fold them accordion style and begin building the book. (To mark the creases, have them fold the square paper in half, in half again, and in half one more time. 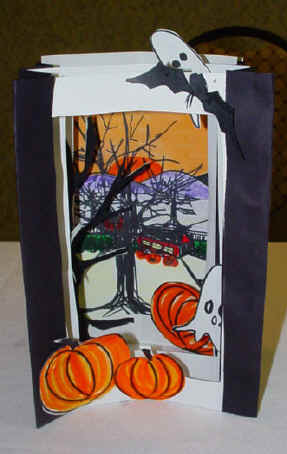 Open and use creases as a guide for accordion folding.) Glue 3 of the frames on the accordion folds at equal heights on each side (last frame will be glued on top – to create a tunnel effect). Begin designing and coloring the front frame. Day 3: Warm-up with visual skills using art prints. Put 2 or 3 prints on the board and have students identify the foreground (characters, subject) and the background (setting). Finish coloring the front frame and glue in place. 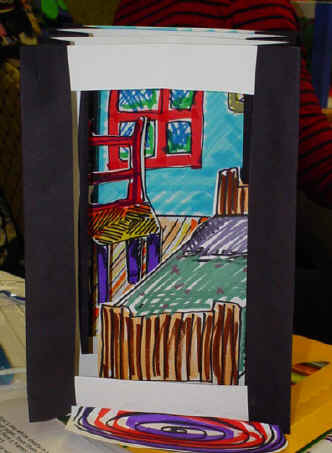 Use scraps (saved from insides of frames) to draw the foreground objects. Draw in pencil, outline with Sharpies (optional), color in marker, cut out, and affix to the frames. Each layer should have at least one object. Day 4: Finish up the project, review and student-based assessment. • Is my project constructed correctly? • Do I have a background setting? • Do I have foreground details? • Is my project neat? • Is my project complete? Exploring Tunnel Books (Archive) - An in depth history of tunnel books. This is an archive of the site. The site went off-line in December of 2010. Video titled Film Before Film. 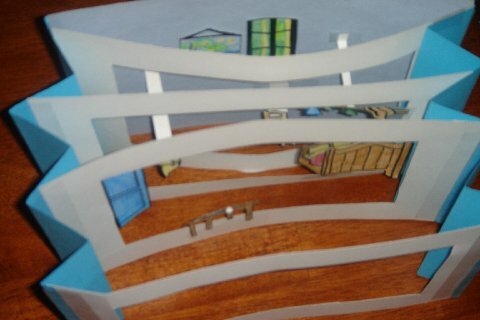 YouTube that shows various types of tunnel books, flip books, zoetropes, stereo viewers, etc. from the Victorian era. 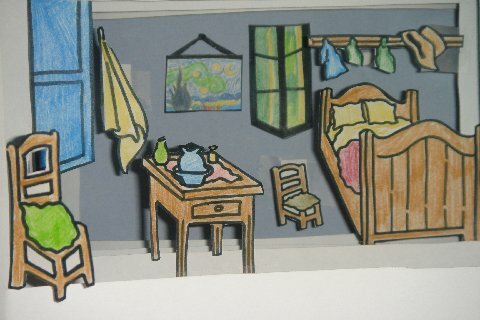 Artist Research Lesson - "Van Gogh's Room"
Van Gogh's Bedroom by Yolanda Cooper, a second grade teacher in Harlem. © incredibleart.org. All rights reserved.